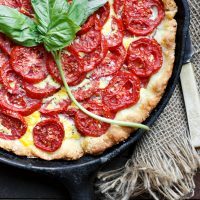 This Tomato and Goat Cheese Pie with Biscuit Crust features roasted tomatoes, a layer of fresh basil leaves, a cheesy goat cheese and Parmesan filling all atop a thick biscuit crust. So I decided to call it Northern Tomato Cheese Pie, with a tongue-in-cheek nod to my north-of-the-border spin on the southern classic. I kept the biscuit crust, because … biscuit crust!! On top of that is a cheesy filling, with chunks of goat cheese, Parmesan, a couple of eggs to hold it all together (but not so much egg that it became a quiche), a touch of cream and lots of pepper. Then there’s a layer of fresh basil leaves. Topping it all of is a generous layer of fresh, thick-sliced roma tomatoes. This pie is pretty much all my favourite flavours all together in one slice and it was everything I imagined … and more! 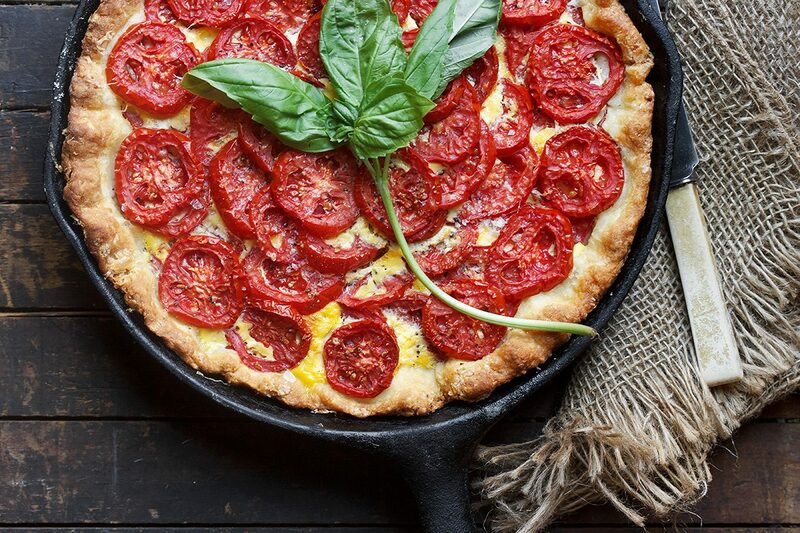 The biscuit crust bakes in to a generous base, that pairs beautifully with the tangy cheese and rich, roasted tomatoes. 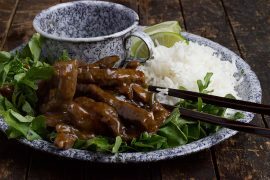 This would be a great meatless dinner served with a side of fresh greens, a delicious and pretty brunch dish or a lazy weekend breakfast treat. 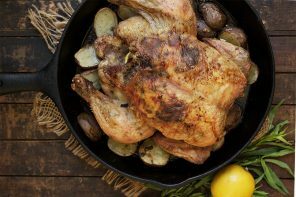 Make this in a skillet or use any deep-dish pie plate and enjoy it warm or at room temperature. Don’t skimp on the tomato layer. As you can see from the “slice” photo (below recipe), the biscuit layer cooks up nice and thick, so you want to keep your topping in balance. I did one layer of over-lapping tomatoes, starting from the outside, then added another ring around the outside. The top, exposed edge of the biscuit crust browns quickly. Check your pie around 20 minutes in and place a piece of aluminum foil loosely over-top if edge is brown enough already, to prevent further browning. Even though it’s the height of fresh tomato season, with lots of great tomatoes available, for my money, nothing beats a roma/plum tomatoes for this type of dish. They release less moisture, they hold their shape well when roasted and they keep their awesome rich red colour. Fresh basil leaves are a really nice addition to this pie, so if you can use them, I’d highly recommend that. If unavailable, a generous sprinkling of dried basil leaves would work. Don’t forget the finishing salt. While I do add salt and pepper to the top of the pie before baking, I love to finish with some Maldon salt crystals. It’s a small touch that make a big difference in the finished dish. A delicious cheese and tomato pie, with a goat cheese and Parmesan filling, topped with fresh basil and a generous layer of tomatoes. I recommend roma/plum tomatoes. Make the crust: Combine the flour, baking powder, baking soda and salt in a medium bowl. Whisk well to combine. Add cold butter cubes and use your fingers to rub the butter in to the flour until they are pea-sized-ish pieces. Add about half of the buttermilk. Using a fork, stir to combine. Begin adding a bit more buttermilk while you continue to mix with a fork, adding only enough to bring the dough together into one mass. Remove to a piece of plastic wrap. Press in to a 1-inch thick disc, wrap tightly and refrigerate for one hour. While the dough is refrigerating, place slices of tomatoes on a triple-layer of paper towel to drain. Be sure to allow them to sit on the paper towel for at least 30 minutes. Prepare filling by combining all the filling ingredients in a medium bowl. Stir to combine, but don't break up any large chunks of goat cheese. Set aside. When dough has chilled, remove to a well flour surface and using a rolling pin, roll in to a large enough circle to just fit your skillet or pie plate (bottom and sides). Place rolled dough in pan and press to fit. Pinch the top edges a bit to make it a little pretty, if you like. Pour filling in to pie shell and spread to an even layer. Top filling with basil leaves. Arrange tomatoes on top by making over-lapping rings, starting from the outside and working your way in to the center. Go back and add a few more in a ring around the outside edge, so you have a nice layer of tomatoes. Season the tomatoes with a generous bit of salt and freshly ground pepper and sprinkle with an additional tablespoon or two of grated parmesan, if you like. If your side crust is extending well above your filling, push it down a bit, to within about 1/2-inch of the filling level, just so it doesn't over-brown as it cooks. (I didn't have any issues with needing a baking sheet underneath in my skillet, but if your pie seems really full in your baking dish, you may wish to bake it on a baking sheet, just to be sure). Bake in preheated 425 F. oven for about 30 minutes, checking top edges of crust after 20 minutes. If already browned nicely, loosely place a sheet of aluminum foil over-top for the last 10 minutes of baking. Check pie by inserting a butter knife in the centre to confirm the filling is set (there may be a little bit of moisture on top from the tomatoes, but the filling may still be set well underneath). Am I missing how long this bakes for? About to put it in the oven and I don’t see a time. Bake in preheated 425 F. oven for about 30 minutes, checking top edges of crust after 20 minutes. If already browned nicely, loosely place a sheet of aluminum foil over-top for the last 10 minutes of baking. Check pie by inserting a butter knife in the center to confirm the filling is set (there may be a little bit of moisture on top from the tomatoes, but the filling may still be set well underneath). Oh my goodness! This is absolutely gorgeous. My husband’s aunt used to make a wonderful tomato pie – with all that mayo and cheese :) I like your version and especially with that biscuit crust. Beautiful! This would definitely be a summer meal for me. I love your new take on an old classic! Thanks Chris :) I have had it for dinner for the past 3 nights! Really hits the spot. Not only was this absolutely delicious, but it was also a couple of Seasons & Suppers first for me: first time I went from reading recipe to making it in less than six hours and more importantly, first time I’ve made a pie crust. Wow. This is another winner. 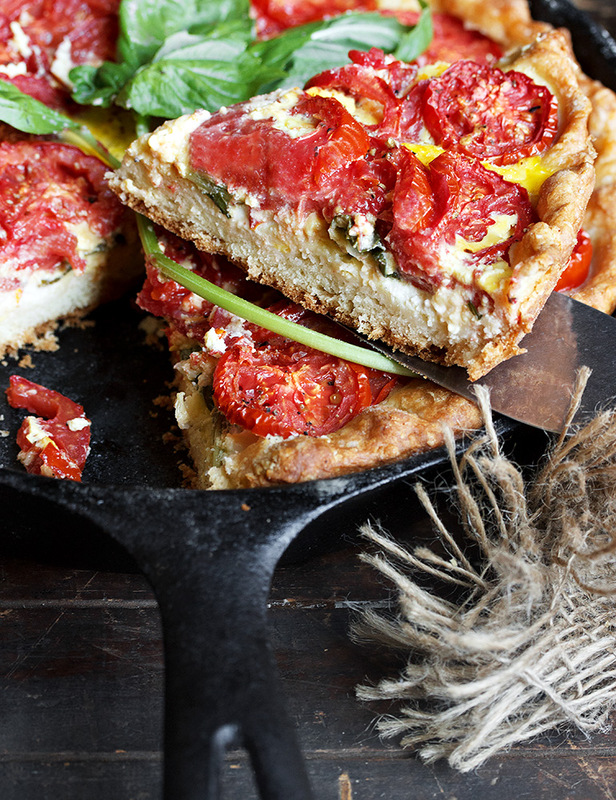 This pie looks incredible, an absolute must try with my garden tomatoes! Thanks so much Jennifer. I will heed your advice and report in after Tuesday. Yum!! I will definitely be making this (and taking your advice to leave bid goat cheese chunks!) This looks so good! Jennifer – love, love love the look of this, going to try to make for company on Tuesday. I’m not confident at making crusts but will forge ahead anyway. One easy question can it be served at room temperature? Hi Midge and thanks :) I think you’ll love this pie! Crust making is not my forte either, so I hear you. Just remember that this is a biscuit dough, so will be a bit different than a pie crust dough. 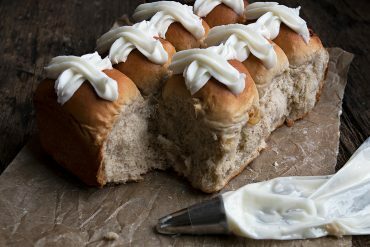 It’s quite moist, but rolls out really easily with liberal sprinklings of flour (both on top and underneath). Also, if you roll it out just big enough to fit your pan, it will be about twice as thick as a pie crust dough would be. That’s what you want. And yes, this pie is lovely at room temperature. Enjoy! As much as I love the southern classic, I am going to have to say I love your “northern” version a little bit more! And I haven’t even tried it yet! I just LOVE that you used goat cheese and parmesan! 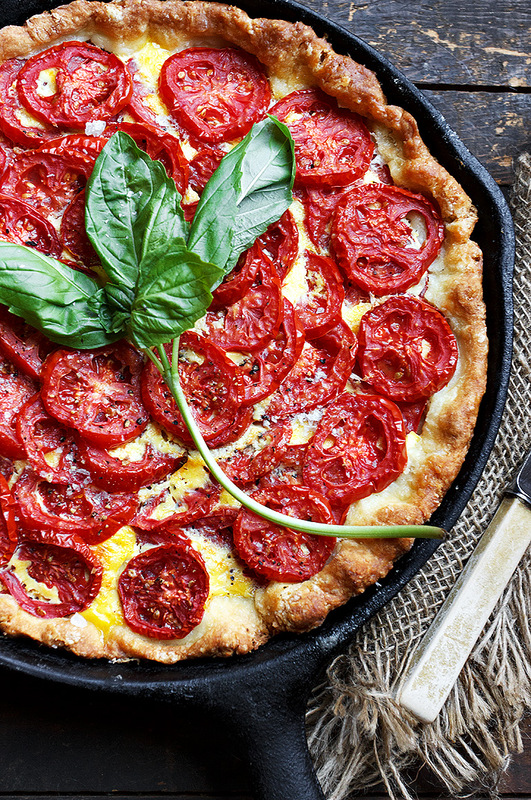 This is a tomato pie fit for a queen! NEED! Cheers, Jennifer! Sorry, found the cooking time, love your recipes! Oh my goodness Jennifer, this has to be the most gorgeous pie ever! 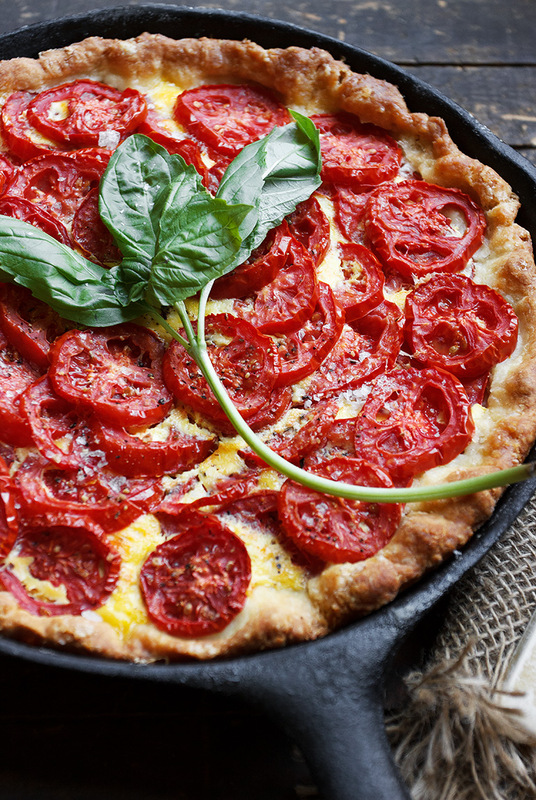 That crust, those juicy tomatoes! You’ve got me absolutely drooling! I just got to pick some fabulous tomatoes from a neighbor’s garden, so I know what I’ll be making!